Bombardier and Mitsubishi are heading for a big row in the courts after Bombardier accused the Japanese industrial giant of deliberately targeting its employees to steal proprietary secrets. 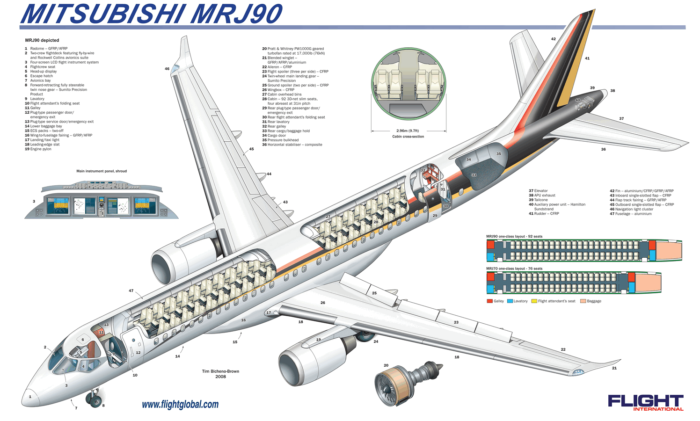 The information was used to help with the certification of the Mitsubishi MRJ regional jet. According to Aero Space Testing International Bombardier also alleges Mitsubishi aggressively targeted its employees, with billboards placed outside its flight test center, emails, and even a job fair near the company’s headquarters. The campaign resulted in Mitsubishi poaching 92 employees from Bombardier. The Lawsuit also claims that bombardier employees emailed sensitive documents to themselves. These documents which mainly concerned the testing and certification process of the CSeries and Global 7000 and 8000 aircraft. Where then later used in the certification process of the Mitsubishi MRJ regional jet. 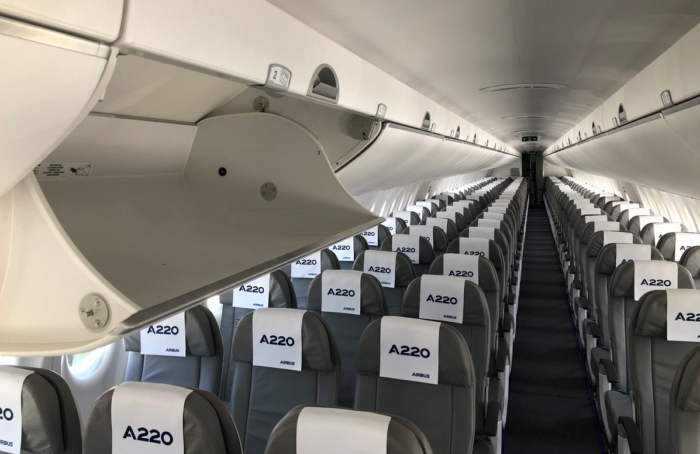 Airbus A220-300 seating. Not Surprisingly Mitsubishi has completely rejected the allegations in the Bombardier lawsuit, calling them baseless and without merit. It is hard to see how this case will play out, after all, laws against the restriction of trade may come into play, as well as the fact that Bombardier did not have a no-compete clause in its employee contracts. On the other hand, the documents issue could be quite problematic since it almost amounts to corporate espionage. Clearly, Bombardier is motivated by profit, than any other point of principle. The company alleges in the suit, it will now have to compete with a revived Japanese aviation industry several years before it should have. One a final note, you do have to wonder about the culture at Bombardier, for a competitor to poach 92 highly skilled employees things must be less than harmonious at the company.